For the last two days the smells of chocolate & peppermint have been permeating in my home. It is delicious! Growing up peppermint was not used much, if really at all. Maybe it was not a big thing in my family..then. I bet if I baked these babies up for my family they would devour them quickly. The dessert baked most often growing up was Christmas Sugar Cookies. Santa loved them! Since being married and moving away, so far away now that I am in another country, I have to share all my baked goodies with friends I make and as always my husband takes them into work and shares them with whomever would like some. There are many single sailors enjoying my goodies this past week & I think it is important to have home baked stuff this time of year, near or far. 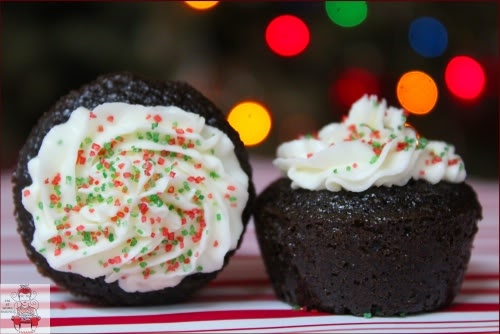 I’ve been baking cookies but chose to make a double batch of these mini cupcakes and let me just say…They are AMAZING! Grease & flour your mini muffin tins or use mini cupcake liners. Add eggs, milk, oil, and vanilla. Stir in boiling water. Batter will be very thin! Fill ⅔ full with batter. Bake for 8-10 minutes, remove immedietly from tins and cool completely before frosting. In a large bowl, cream shortening and butter with mixer. Add peppermint. Gradually add sugar one cup at a time, beating well. Scrape sides and bottom of bowl often. If it is to dry or you would like it thinner, add milk, one tablespoon at a time. Keep bowl covered with a damp cloth until ready to use. Do not be alarmed at how watery thin this batter is. Even though I understood it would be I was still surprised just how thin it was. It is perfectly fine.